New Delhi: Manipur Kuki Tribe on Thursday, called for a nationwide observance of the 25th Anniversary of Sahnit-Ni, the Kuki Black Day, on 13 September 2018. 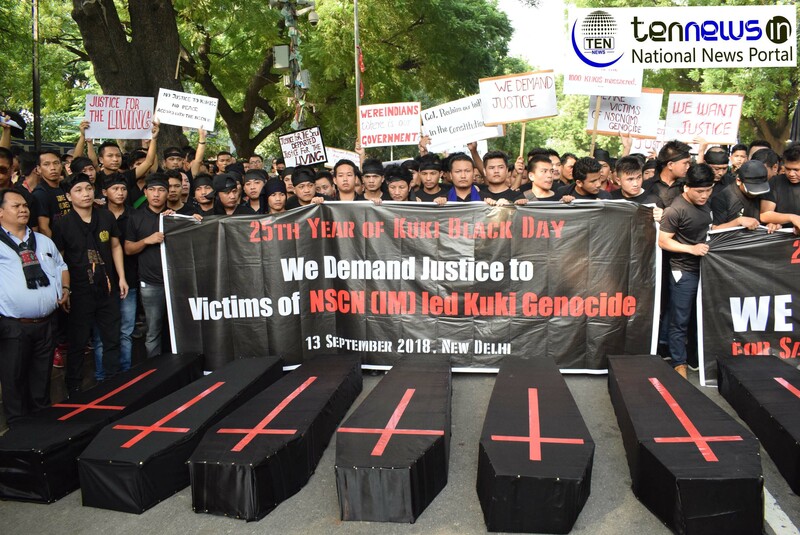 With thirteen dummy coffins, symbolizing the immortal bodies of the 1157 innocent Kukis massacred by the NSCN-IM, a silent protest rally was held on the Parliament Street, New Delhi. Part of the protest demonstration also included speeches, prayers and elegies for the victims of the genocide. "On 13 September 1993, the NSCN-IM massacred 115 innocent Kuki villagers in a most despicable act of savagery. It is popularly known as the Joupi Massacre when 87 of them were brutally massacred. With their hands bound to their backs, they were barbarously hacked to death with machetes and spears, splitting their heads from their bodies. Their headless bodies and decapitated heads have been rotten unattended in the forest. The gruesome massacre had shocked the whole world. The world of media and the Kuki people called this NSCN-IM ethnic pogrom as the “Kuki Genocide”. He further said, "This day was the darkest day in the history of the Kukis. Therefore, we decided to observe 13 September annually as Sahnit-Ni or the Kuki Black Day until justice is done to the victims of the NSCN-IM led Kuki Genocide"
"We appeal to all right-thinking and peace-loving citizens of India and the world to support us in our struggle for justice, peace and the security of life and property of the Kuki people. Kuki state demand is a genuine demand for permanent peace and stability in the region," added Kuki Tribe Spokesperson.